Here’s a cold soup with a wonderfully fruity taste. 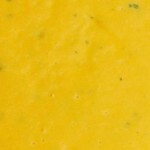 It nicely combines mangos and Scotch bonnet chiles, but you can substitute any fresh chile that you have on hand. Place the pineapple, cucumbers, green onion, Scotch bonnet, mango, and bell pepper in a blender or food processor and puree until smooth. Transfer to a bowl and add the remaining ingredients and salt to taste and stir well.